Grew up in Malta, NY. Learned how to sew at the age of 8 thanks to Grandma and the Saratoga County 4-H. 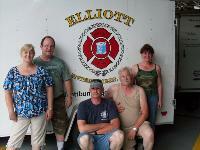 Along with husband Rob, started the business in their 4 room apartment in Springvale, Maine in 1994. She is rarely on the road these days, but is the Office manager and is available for any questions about invoices and billing. She is sometimes found in the back of an ambulance as she is also paramedic or fighting fires with the crew of Newfield Maine Fire Dept. Rob - The Vice President and Lead Sewing Technician. Grew up in Newburyport and Gloucester, Mass and then Ballston Spa, NY. He is now a fire fighter in the Newfield Maine Fire Dept. Joined the Navy in 1972 and retired as a 1st Class Petty officer, Aircrew Survival Equipment-man in 1993. The Navy is where he learned to sew, and that combined with his love of firefighting is what gave birth to our business.